The Paseo in Spain. Strolling around the city after work. The Spanish culture has some interesting rituals. I first became aware of the “Paseo” which translates to “a leisurely usually evening stroll” while on my second day in Valencia Spain. I was out walking around at about 6PM and the streets were filled with people walking around. There were family’s, couples, young people, old people and just about every other combination. They all seemed to be going somewhere important so I decided to follow the river of people to see what was going on. This lasted for about an hour until I finally realized that there was no particular destination and they were just walking around the city. I found this confusing since this type of thing does not happen in the US. 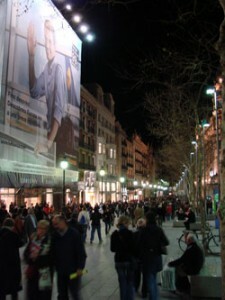 I continued to witness this “Paseo” in the other cities I visited including Madrid, Barcelona and Seville. The more I watched it and tried to participate in this ritual the more I liked it. I would love to live in a city where I could go walking around after work with friends and family. This type of thing does not happen in Phoenix, Arizona especially in the summer when the temperature is 100-120 degrees everyday for four months. During the Paseo the people often stop in a bar for a drink and some tapas or shop in one of the many stores lining the streets. This goes on for a few hours until everyone is ready for a late dinner. If you are ever in Spain you should definitely try to participate in the Paseo.